Ask any video game console owner when downloadable games earned their respect. You'll get several different answers. Some may say it happened when “Geometry Wars: Retro Evolved” was released through Xbox Live Arcade. Others may claim it was the success of Nintendo's Virtual Console on the Wii that sold them on the concept. There is no right answer. But saying the arrival of “PixelJunk Eden” on the PlayStation Network certainly isn't wrong. This stylized platform game places players in gardens as a tiny creature called a Grimp. Players control the Grimp's trajectory with the left analog stick and propel it in that direction - like a jump. This action is the crux of the Grimp's ascent up the plants of the gardens in order to obtain Spectra, which signal the completion of a garden stage. As the Grimp jumps into plants, it sticks to them regardless of the angle at which it hits the curvaceous structures. From there, the Grimp can either jump toward another plant, or swing in a circular motion at the end of a short-lived strand fixed to a point on the plant. It is with this swing action that the player can collide with aimlessly floating foes, who are turned to pollen upon impact. Nearby seeds absorb the pollen and, once filled, blossom into additional stalks along which the Grimp can climb. As these plants waver in the air, they steadily complicate the platforming with exacting physics friendly only to the most well-timed jumps. In later stages, the Grimp encounters floating enemies that actually attack it by bouncing it across the screen or severing its swinging strands. Speeding the pace of the action is the game's synchronization meter, a life meter that automatically counts down as the Grimp swings and jumps through the garden. The meter can be replenished by collecting crystals in the same swinging manner as the Grimp collides with enemies. Though the meter can frustrate in a player's first few “Eden” go-rounds by cutting the action short, learning to manage it comes naturally. Without that obstacle, the game would simply be too easy and, as a result, rather fruitless. Once players master the deceptively simple controls, there is a kinetic grace to behold in the Grimp's movements. With well-timed swings and jumps, the Grimp can weave its way through the baroque garden landscapes in a balletic manner reminiscent of Spider-Man. The action's balance of accessible controls with a deep play dynamic will likely addict many a player. Accentuating the spectacle are the flourishes of light and color that accompany collisions with foes and the filling of the air with pollen. The game's whole aesthetic is a breathtaking collage of layered patterns, ornate plants and intensely warm and cool shades. Drawing players in further is a trance music soundtrack so organic to the pace and look of the action, it's faintly noticeable. Some players may feel tedium as they revisit gardens to collect all five of their Spectra. But with cooperative play and a point system contingent on completion time, seed pollination count and other factors, “Eden's” replay value fades little. Players not content to compete against themselves can compare their scores to the game's online leader boards, and the PlayStation Network's new trophy system provides another batch of challenges. There are more than enough apples in “PixelJunk Eden” to not only delight players, but convince any remaining doubters that downloadable games will compete with their pricier physical counterparts in quality. 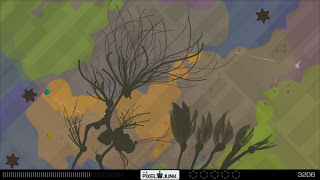 The final boss: With its vibrant and addictive platform play, “PixelJunk Eden” may ultimately prove a key moment in the popular acceptance of downloadable games as a legitimate delivery system for the medium.